Choosing the right group activity can prove to be difficult, especially if you are trying to cater for a range of preferences. Extra large groups may find outdoor trips too hard to navigate, whereas smaller groups may find it difficult to find an activity that doesn’t require less than five people to participate- and this means that getting the right balance for your crowd can be a nightmare. Well, that’s where paintball comes in! It is an activity that suits all ages, group sizes and even mixed groups, and with any number of players (from 2-100!) able to join in on any one session, it really is designed for any kind of party to enjoy. Whether you are looking for a fun activity to enjoy with your groomsman, your youth group, or even your wedding party, there are many reasons why you should play paintball. Paintball is a fun and social game that doubles up as an adrenaline-filled sport. Because paintball arenas offer both indoor and outdoor scenario-built fields, many players enjoy the element of detachment from everyday life that comes with navigating a custom-built combat zone. Paintball encourages healthy competition as well as team spirit, and as a result the entertainment often carries on long after the actual event! Paintball is undoubtedly an active sport, so while there may be periods of time spent sitting, hiding and waiting to pounce; most games are spent sprinting, jumping and navigating unfamiliar terrain. Although adrenaline and adventure are typically the name of the game when it comes to playing paintball, groups have the ability to strategize before the game- as well as during it. More often than not winning a game of paintball is achieved by strategizing just as much as by working as a team, and this is a major element that helps paintball to cater to a wide range of groups. Younger groups tend to play paintball for fun and even team-building purposes, where many adult groups find themselves playing paintball for the love of the competition. This means that while many people use paintball as a one-off day out or a group treat a few times a year, there are groups and individual players who play paintball regularly! 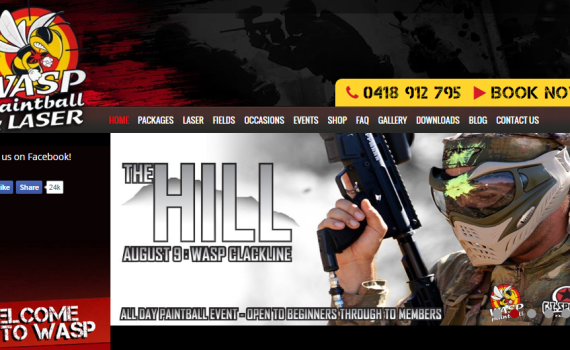 As there is a wide range of paintballing equipment on the market to enrich the overall competitive experience, it is entirely a sport that can be played on a regular basis. Players can upgrade and customize paintball gear (from the mask, hopper, tank and gun all the way to the paintballs!) to tailor paintball games to each individuals specific needs, the possibilities are endless! What really keeps paintball players entertained again and again is not the variety of the settings or equipment; it’s the absolute unknown of the game play itself. Each event will be different from the last, from the strategies that are put into place to the overall outcome, so you will get something different from the experience every time. Although there may be a winning team, there are certainly no losers when you play paintball!